I recently bought an old, second hand chest of drawers. I was cleaning away the old lining paper when I discovered, underneath, two large photographs, one of a church or chapel interior, the other of a group of nuns. There’s no date, no identification other than the photographer’s mark which says ‘Wickens, Bangor’. The church/chapel interior is small, with three rows of chairs (not pews) seperated by a central ailse. It seems to be Catholic; a sanctuary lamp can be glimpsed hanging above the altar, and statues appear to the rear right and left of the altar. In addition, there are framed pictures hanging on the walls around the room. The photograph of the nuns is taken outside, in a garden with a building to the right. There are 14 individuals, most have a black wimple, but two, in the rear, have an all-white wimple, and these seem to be younger than the others. One individual, a younger woman, who appears in her late teens, is dressed in black clothing, with a white collar, and a black bonnet that ties in a bow tie underneath her chin. Although in all likelihood these individuals have now all passed on I have not posted the picture here in order to respect the privacy of these ladies. I decided to do some investigation into these to see what I could find out. The name of the photographer was easily googled, John Wickens – according to the National Library of Wales website, was a prolific and award-winning photographer working from Bangor in North Wales until 1936 when he died. He apparently started working there in 1889. These two dates give us a probable terminus ante quem and terminus post quem for the photographs. A check on google for nunneries in North Wales reveals that there was a Bendictine community at Talacre, at what was then Talacre Abbey between the years 1921 and 1988. This house, previously owned by the Mostyn family, housed a chapel on site (a rare Reformation survival, according to the article in The Tablet), which was taken over by the Benedictines until it was too small, and a larger chapel was built on the site in 1930. 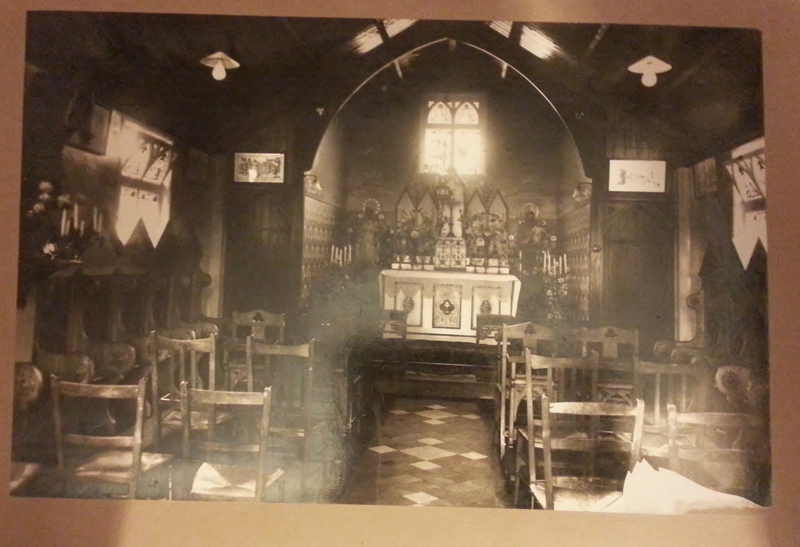 The photograph of the chapel interior could be either chapel; although given the date so soon before 1936 it is more likely to be the former chapel, if either one. However, this is a guess in the dark for now, and although I have looked at other candidates (such as Catholic churches in the Bangor area) I’m quite stumped for the time being. The community at Talacre Abbey moved on in 1988 to a different site in Chester, which still exists and I have written to the Abbess to ask if she would take a look at the picture, or forward my email to someone else who may know. Or if anyone reading this may know where it is; please feel free to speculate in the comments to this post. As I find out more information I will update here.